The only goal on the market that will maintain free-throw and three-point distances from any rim height. The direct connection feature is rated for 2000 pounds making this goal the strongest adjustable goal on the market. The Absolute toughest Goalrilla Goal ever built. The engineers were given an open challenge to make the most awesome, adjustable, in-ground goal on the market and they did not disappoint. If you have the budget, this is the goal. Direct Connect Technology – as with all twelve Goalrilla models, dunking is permitted and encouraged! The difference here is this goal is designed with a 4”x4” steel beam directly connected to the rim, transferring up to 2000 pounds of vertical forces through the beam into the post versus the backboard and backboard frame. This is a unique feature only found on this Goalrilla model and beyond the strength needed for even the most aggressive players. Patented height adjustment – This goal has a patented height adjustment that allows the backboard to adjust vertically without moving horizontally like most all adjustable in-ground systems. Basketball purists who build courts and invest a lot of money to paint free throw and three-point lines love this feature as it keeps the distances to the rim consistent at all rim heights. This goal has all of the popular Goalrilla features offered including a ½” glass backboard, heavy weight flex breakaway rim, adjustable rim heights from 7.5’ to 10’, clearview backboard, and a removable anchoring system. In addition, this goal has a post pad that looks like it is large enough to fit an NFL goal post and a NCAA specified backboard pad. The thickness of these pads make this goal look even more massive than it already is. This goal is heavy and will require three to four men to complete the installation. This may be one goal I would suggest that you call a professional installation crew in to take on the task. The installation process is two-parts. Requiring seven days to allow the concrete to cure. A little frustrating but well worth the wait! An awesome addition to our home for the whole family! Long nights playing hoops with our personal back yard half court Basketball hoop! The best quality and looks amazing!! A must have for any family who loves Basketball. Good for slamming and handles it like a pro court. A little high in price but worth every penny! It’s a little work to install but take your time and you will have no regrets! A Perfect Engineering Masterpiece. PROS: 1- The DC72E1 is tough… 2- Excellent assembly instructions… 3- Extremely stable… 4- Ball Rebound off the glass is perfect… 5- Top of the Line Professional Quality… CONS: 1- None The Goalrilla DC72E1 is Outstanding in every way… Frankly, I’m overwhelmed… My words can only fall short of fairly describing it. I congratulate the engineers at Goalrilla for this masterpiece. Thank you very much. If you need to move or relocate this Goalrilla Basketball Hoop System, you will need a new anchor system. This basketball hoop is very easy to unbolt and reassemble wherever you want to move it. 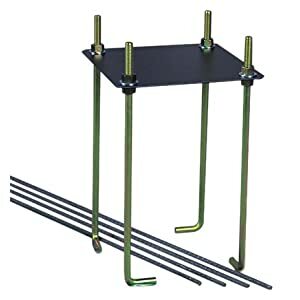 The system comes with an anchor set, however, if you ever need to move it, you can buy an additional anchor the Basketball Goal Store. The Goalrilla DC72EI (model B6101) is the complete package. This is the goal you often see when watching TV shows, profiling professional athletes and movie stars’ homes. It has it all and in addition is one of only a couple high-end, in-ground systems that is certified safe, meeting ASTM Safety Guidelines. We know this goal is not for everyone. However, if you are one of those who wants the best and can afford it… buy this goal, you will not be disappointed! To read an even more comprehensive review of the DC72E1, visit the Basketball Goal Store Review. Cheapest place I found to buy it was at Basketball Goal Store, which sells it for $2379, includes free shipping.